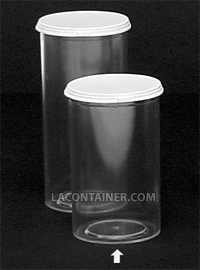 POLYSTYRENE VIALS - Thornton - Crystal-Clear Plastic Vials for packaging medical, food, or industrial products. Thornton Polystyrene Vials are an excellent choice for packaging medical, food, or industrial products that need to attract your customers attention. The crystal-clear, glass-like appearance of these vials is well complimented by the white polyethylene snap-cap that has an easy open tabbed design. The straight wall design of these vials is perfect for the application of adhesive backed labels or embossed decals. These vials are proudly manufactured in the USA and usually ship within 24-48 hours. 47.6mm Dia. X 84.1mm Ht. 1 7/8" Dia. X 3 5/16" Ht.